Discussion in 'Hikvision' started by bp2008, Mar 11, 2015. It is now possible to reset passwords on some cameras that won't work with the reset code tool, by exploiting a backdoor that was recently made public. I've built a tool for that. It only works with cameras (not NVRs. If you need to reset an NVR, click here. 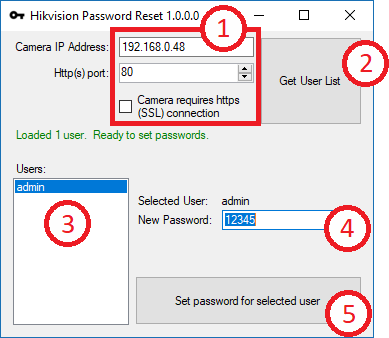 GitHub - bp2008/HikPasswordHelper: A tool which exploits a backdoor in Hikvision camera firmwares circa 2014-2016 to help the owner change a forgotten password. Disclaimer: This tool may or may not work for your camera or NVR. Please follow the instructions very carefully and be precise in all your inputs into the tool. Devices on newer firmware require a more secure password reset procedure which I can not help with. I think this tool will only work with cameras running firmware older than 5.3.0. I do not know what version is the cutoff for NVRs. Inside this spoiler block is the complete source code which you can write to a .html file on your computer, allowing you to use it offline. Some will say it is irresponsible to publish this. I disagree. Evidently a number of people outside of Hikvision have possessed the ability to generate these codes for a while now. I found this (similar) functionality freely available for download elsewhere, so I really don't feel bad about releasing this and making it a bit easier to recover your cameras. Ballistic, giangievo, levian and 84 others like this. Mehul and insteek like this. heh heh, I wasn't done with this a couple hours ago. 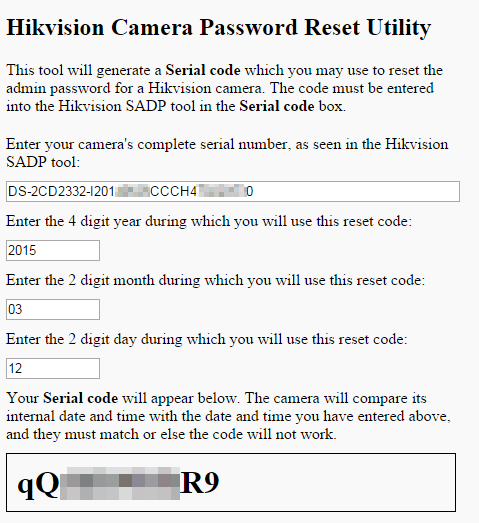 Cool, I tried it with a Swann branded Hikvision cam and didn't have to remove anything from the serial. So that must just be a quirk of the NVR. This is awesome, many thanks for sharing! This will definitely come in handy for many. Are you sure about that? 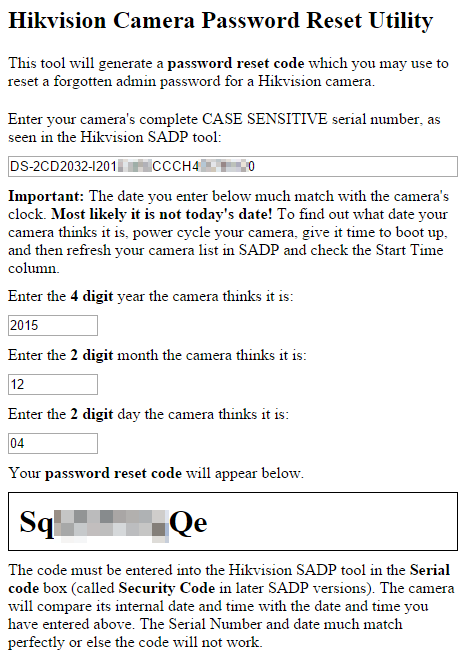 There need to be no errors at all in the serial number, and the year has to be 4 digits ("2015"), month 2 digits ("03"), day 2 digits ("12"), and the camera's internal clock needs to match the date you entered on the form. I do admit though I did not try it with a Chinese camera, only one from USA. yeah i tried a couple of times, the cameras clock matched the one on the form. tied two different cameras but still nothing. both of them Chinese. Tested on a chinese 2332 and it worked fine. Full serial number, today's date, no trouble at all. Simply amazing. The time and trouble you've saved everyone is priceless. Thank you for sharing! thank you. it worked. apparently i was doing something wrong. Thanks for sharing, this can make life a lot easier for a lot of Engineers. Hi, I have just bought a new DS-7608NI-E2/8P from a Chinese seller, and when trying to log in for the first time it is telling me the password 12345 is wrong. I have emailed the seller for the reset code however have not had any reply yet. I have tried resetting the password using this tool however keep getting the message password recovery failed. I have tried the full serial number and by deleting the model number from the start. Has anyone else successfully used this reset tool with this model NVR?